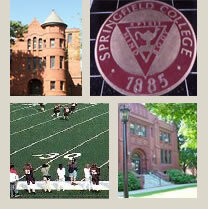 Founded in 1885, Springfield College is a private, coeducational institution offering undergraduate and graduate programs that reflect its distinctive Humanics philosophy - education of the whole person in spirit, mind, and body for leadership in service to humanity. It is world renowned as the Birthplace of Basketball®, a game created by alumnus and professor James Naismith in 1891; as the alma mater of William G. Morgan, inventor of the game of volleyball; for its long standing and close relationship with the YMCA; and for academic excellence. Springfield College has educated nearly 44,000 people who are serving throughout the United States and in more than sixty nations. Today, over 5,000 students attend classes at the College’s main campus in Springfield, Massachusetts, and at campuses in Boston, Massachusetts; Tustin, California; Wilmington, Delaware; Tampa Bay, Florida; Manchester, New Hampshire; Charleston, South Carolina; Houston,Texas; St. Johnsbury, Vermont; and Milwaukee, Wisconsin. Richard B. Flynn (1999), B.S., M.Ed., Ed.D. Jean A. Wyld (2001), B.A., M.S., Ph.D.
David G. Braverman (2005), B.A., M.A., Ph.D.
John L. Mailhot (1988), B.S., M.B.A.
Jill F. Russell (2000), B.S., M.A., Ph.D.
John White (2001), B.A., M.A. Mary Ann Coughlin (1993), B.S., M.S., C.A.G.S., D.P.E. Anne Herzog (2011), B.A., M.A., Ph.D.
David J. Miller (1993), B.A., M.S., C.P.T., Ph.D.
Charles J. Redmond (1969), B.S., M.Ed., M.S.P.T. Francine J. Vecchiolla (1990), B.S., M.S.W., Ph.D.
Robert J. Willey, Jr. (2002), B.S., M.A., Ph.D.
Mary N. DeAngelo (1984), B.A., M.Ed. Keith A. Ingalls (2000), B.B.A., M.S.